We can see here the covers of two SUPERMAN NO.175 February 1965. Curtis Swan had drawn two covers for this issue and National Periodical Publications (now DC Comics) selected the one from the right. I prefer the one from the left. What do you like the most?. If you want, write to me to MBAYONA@teleline.es with your name and country and we'll make a list with the preferences that we'll put in this page. Podemos ver las portadas de dos SUPERMAN NO.175 Febrero 1965. Curtis Swan había dibujado dos portadas para este ejemplar y National Periodical Publications (ahora DC Comics) seleccionó la de la derecha. Yo prefiero la de la izquierda. ¿Cuál te gusta más?. Si quieres, escríbeme a MBAYONA@teleline.es indicando tu nombre y país y haremos una lista con las preferencias que iremos poniendo en esta página. 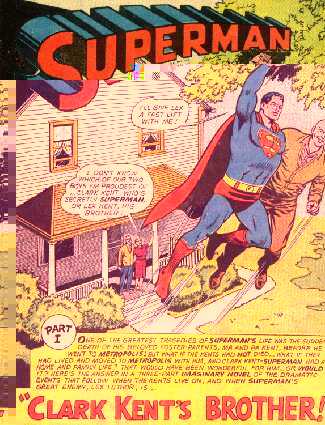 Inside the issue we can read an Imaginary Tale in three parts drawed by Curt Swan & George Klein. 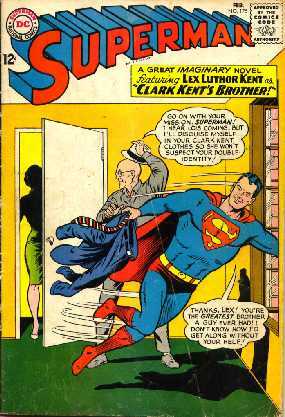 In this story, Lex Luthor becomes Clark Kent's Brother, adopted by the Kents. Pete Ross hates Superboy because Lana Lang only see the great facts of the Boy of Steel. (Clark Kent's Brother. Part I). En el interior del cuaderno podemos leer una Historia Imaginaria en tres partes dibujada por Curt Swan & George Klein. En esta historia, Lex Luthor se convierte en el hermano de Clark Kent al ser adoptado por los Kent. Pete Ross odia a Superboy porque Lana Lang solo ve los grandes hechos del Chico de Acero. (Clark Kent's Brother. Part I). Later, as adults, all, included Jonathan and Martha Kent live in Metropolis. Clark Kent becomes a journalist in the Daily Planet and Lex Kent a scientist. Clark meets Lois Lane and soon he asks her to become his wife. Lana Lang, frustrated accepts Pete Ross as her husband, but Pete, who is a criminal that hates Superman, plans to kill him. (The Defeat of Superman. 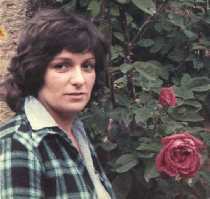 Part II). Más adelante, de adultos, todos, incluso Jonathan y Martha Kent van a vivir a Metropolis. Clark Kent se convierte en periodista del Daily Planet y Lex Kent en científico. Clark conoce a Lois Lane y enseguida le pide que sea su esposa. Lana Lang frustrada acepta a Pete Ross como marido, pero Pete que es un criminal que odia a Superman, planea matarle. (The Defeat of Superman. 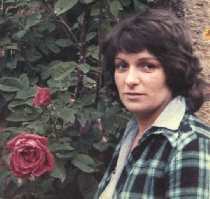 Part II). 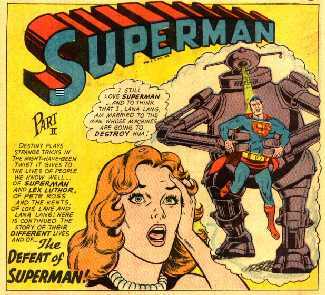 Lex Kent has invented a machine that gives super-powers but is not perfectioned yet and the person who gets the powers dies later. Pete kidnaps Lois Lane and when Superman arrives to save her, a lot of Kryptonite lets Superman defenseless. 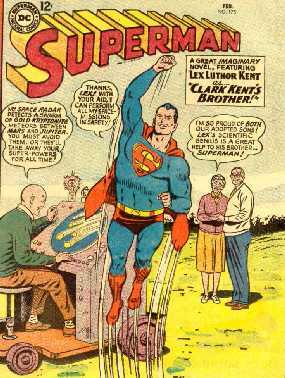 Lana, that knows her husband plans to kill Superman informs the Kents who ask for help to Lex Kent. Lex sacrifice himself to save his brother Clark and gets super-powers from his invented machine and dressed as Superman saves Lois and his brother Clark. In the fight, Pete Ross dies and a little later Lex Kent evaporates like dust. Lex Kent ha inventado una máquina que da superpoderes pero no está perfeccionada aún y la persona que los adquiere muere poco después. Pete rapta a Lois y cuando Superman acude para salvarla, una gran cantidad de Kryptonita le deja indefenso. Lana, que sabe los planes de su marido, avisa a los Kent que piden ayuda a Lex y éste, sacrificándose, adquiere superpoderes con su máquina y vestido como Superman salva a Lois y a su hermano Clark. En la pelea muere Pete y poco después Lex se evapora como el polvo. In the last picture Clark thinks: "Fate is strange. When we were boys, I feared Lex might grow up into a lawless criminal... but instead, he grew up to be the finest person of us all!". (The Luthor Superman. Part III). En la última viñeta Clark pìensa:"El destino es extraño. Cuando éramos chicos temía que Lex se convirtiera en un fuera de la ley... sin embargo, creció para convertirse en la mejor persona de todos nosotros". 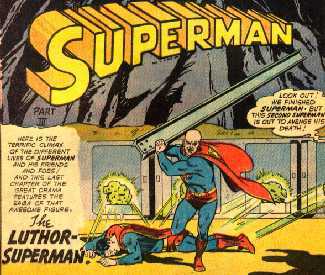 (The Luthor Superman. Part III).